Havoc's are the heavy weapons specilists of the chaos legions. Havoc have shed some of the flexibility of most renegade's wargear for a single, large, potent weapon. Havocs often carry a Heavy Bolter for a higher rate of fire or a Missile Launcher to blast larger areas and punch through armoured targets. Even with the support of specially modified power armour the weight of these weapons and ammunition weighs down Havocs, making them the slowest moving chaos class. Havocs get a choice of two selections of waregear. The first option is the large magazine and high rate of fire Heavy Bolter, with a backup Bolt Pistol and Knife. The second subsitiutes the Heavy bolter for a Missile Launcher with Frag and Krak missiles. 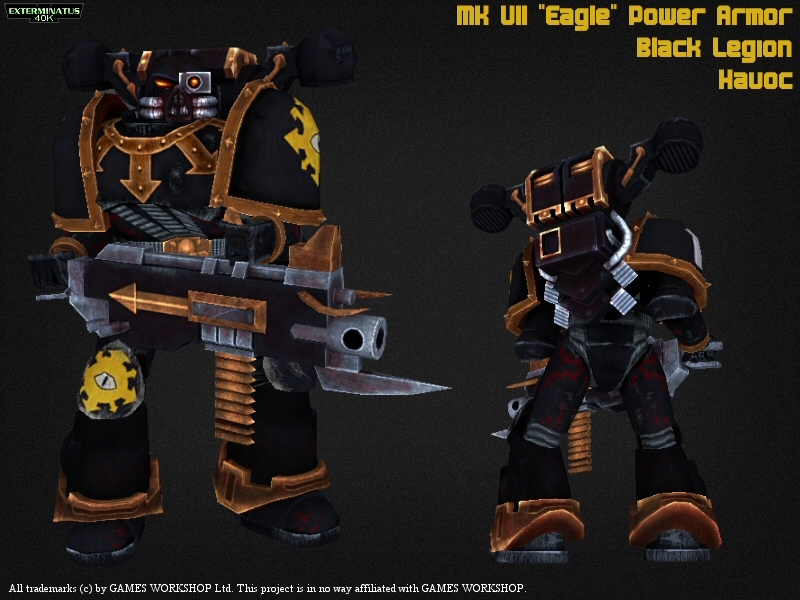 Heavy bolters are excellent at suppressing enemy troops and are powerfull enough to even wear down armoured targets. Missile launchers are great at taking out groups of light troops with it's primary Frag attack, but can also take out enemy Dreadnaughts with three direct hits from the secondary Krak missiles. The missile launcher is lagre enough to obscure peripheral vision, it's recommened to keep your right hand to a wall to prevent being flanked. Due to it's large area of effect you should not fire it at targets in close range or you will end up turning yourself into a crater too. Normal unit composition does not apply well to multiplayer FPS, so you may well see more or less Havocs on the field of battle than on the table top.